This is a compilation of the notes of five different homeopaths made during a seminar of Ananda Zaren in the Netherlands, in May 1989. In total, 29 cases with brief histories are discussed; the reasoning behind the choice of symptoms and rubrics, and the eventual remedy are clarified. This compilation consists of the video cases presented during a seminar in Netherlands in May, 1989. The account is a composition of the notes of five different homeopaths. 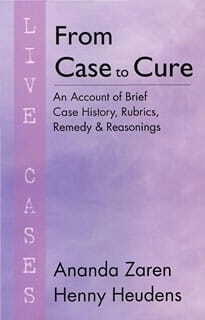 There are in total 29 cases which give brief case histories and help you understand how the case taking has been done, what were the main symptoms which were selected for prescription, how the characteristics were chosen, what were the rubrics and how a particular remedy was selected. All the reasoning for all the above steps discussed above has also been given. This book is of great help as two very eminent homeopaths share their experience and tracks the path of case taking for budding and practicing homeopaths.